Perspective: 1844 - Pillar of Faith or Mortal Wound? October 22, 2015 is the 171st anniversary of the Great Disappointment of 1844. Similarly to the proto-Adventists of New England on that cold, gloomy day 171 years ago, those modern-day Adventists that actually remember the events of that day are too filled with a mix of hope and sadness: sadness for the delay and hope that the coming of Christ will materialize some day soon. The fall of 2015 also marks the 35th year after Glacier View, the infamous 1980 meeting that rejected Desmond Ford’s questions about 1844. The events at Glacier View gave birth to DARCOM 2.0, a revamped version of the Daniel and Revelation Committee from the 1960’s that ended abruptly without a consensus. DARCOM 2.0 published a series of books reiterating the traditional Adventist reading of Daniel and Revelation. But despite the tour de force efforts of DARCOM, 1844 and 1980 continue to unsettle Adventist historians and theologians. For one, most of the materials in the volumes do not deal with the central issues related to 1844 raised by Ford. Some of the published articles were later refuted by our scholars, most of it will not pass muster with outside observers. DARCOM largely ignored the consensus statement voted by Adventist scholars at Glacier view that agreed with Ford on many points. In many ways, 1980 stands as the second Great Disappointment for thousands of ex-Adventists who hoped the church could show great humility and restraint when faced with the possibility that our interpretation of symbolic prophecy could in fact be incorrect. As a result, the Seventh-day Adventist church received a mortal wound that refuses to be healed. According to one study, Australia lost 40% of its ministerial force in the aftermath of the meetings held in that solitary ranch in Colorado.1 The shockwaves reverberated throughout the decade; countless others continued to slip out the back door, unable to come to grips with what they saw as institutional arrogance. Many pastors I know continue to harbor serious doubts about the doctrine. They stopped preaching 1844 a long time ago. The big question still facing Adventism today is the same that confronted our administrators and theologians in before 1980 and ever since: Can the Adventist Church maintain its doctrinal credibility while it holds on to such a problematic interpretation? Many think it cannot and do so for a host of reasons. I will summarize the most important ones below. Second, 1844 as a prophetic marker is heavily dependent on a series of assumptions or presuppositions, which do not naturally stem from the biblical text. Standing tall amid these assumptions is the day-year principle, i.e., the notion that in symbolic prophecy, one symbolic day corresponds to one actual year. Thus the 2300 days of Daniel 8:14 equal 2300 years running from 457 B.C. to 31 A.D. all the way to the fall of 1844. There are many arguments against this so-called “principle,” the main one is that the fact that nowhere in Scripture do any of the authors ever apply such a “principle” to Old Testament prophecy. For example, Luke does not rely on the prophecies of Daniel to vet the authenticity of Jesus as the Messiah, instead he uses Old Testament genealogy. Jesus makes a single cryptic reference to a future fulfillment of the abomination of desolation (Dan 9:27), which appear to apply to the destruction of Jerusalem in 70 A.D. Paul makes no reference to Daniel’s prophecies and instead relies on apostolic eschatology that makes no use of Old Testament time prophecies. Revelation alludes to the prophecies of Daniel, Isaiah and Ezekiel without attempting to interpret them using such a principle. Consequently, scholars have questioned the impeccable timeline. For one, 457 B.C. does not seem to work as the real date for the decree of rebuilding Jerusalem. The decree of Cyrus in 538-536 B.C. makes more sense in context as the fulfilment of the prophecies of Isaiah 44:28; 45:13. Further, 31 A.D. as the date of Christ’s death is astronomically impossible as the Jewish lunar calendar places Passover on that year either on Tuesday or at the latest on Wednesday, not on a Friday as the Gospel of John clearly states (John 18:28; 19:14). Third, the book of Hebrews explicitly negates the notion that Jesus has engaged in a two-phase ministry since his ascension, with the final phase to be commenced sometime in the future. Hebrews 6:19-20; 9:12, 25; 10:19 are full of verbal parallels drawn from the sanctuary ritual culminating with the yearly Day of Atonement to explain Jesus’s sacrifice and subsequent activities as the Heavenly high Priest. For the author, Jesus went “within the veil” in the same manner that the High Priest used to go “within the veil” on Yom Kippur. The expression in Greek is the same used in Lev 16. Jesus went “within the veil,” “with his blood,” “once and for all.” This occurred when he ascended to the Father. A. F. Ballenger had been correct all along. Others have explored all of the assumptions dominating the traditional teaching. See this article for a full treatment. The bias for interpretative tradition in regards to 1844 is illustrated by an interesting episode I witnessed not long ago. I recently visited a certain Adventist seminary and stumbled upon a class on Hebrews. 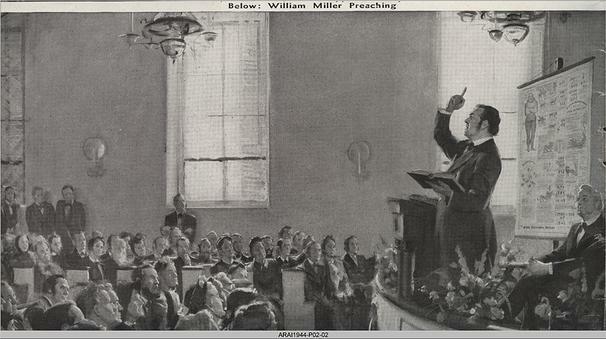 The teacher was a prominent author of DARCOM and the subject was the “inauguration” of the heavenly sanctuary which the teacher used to justify the fact that, although Hebrews 6 undeniably places Jesus inside the Most Holy Place at his ascension, this entering in the Most Holy Place was merely to “inaugurate” it. In other words, Jesus entered the Most Holy Place at the ascension, inaugurated it, left it and then went in again 1844. I was disturbed to see that he was presenting views that had been debunked by another Adventist scholar in an exchange they had in one of our printed magazines. Never did he mention his dialogue with the other scholar. I raised my hand and asked him where in the OT do we see blood going into the Most Holy Place in any of the OT inauguration passages. By his reaction, I suspected he knew that there is no such OT passage. He hesitated for a second and then appealed to the book of Hebrews. In other words, the book of Hebrews proves that in the same book Hebrews Jesus inaugurated the sanctuary with blood, even though none of the OT passages mention blood within the sanctuary, let alone the Most Holy Place. I didn’t press the issue and I doubt his students understood the implications of my question. The fallacy of the argument is disappointing, if not dishonest. This encounter shows me that, at the end of the day, the viability of 1844 as a prophetic marker continues to depend heavily on isolated proof-texts. It seems Adventist scholars who defend 1844 as an unmovable rock are satisfied with finding tiny hooks in a few chosen verses that appear to (albeit remotely) support our position. That is no longer an acceptable way to construct theology. I have studied this subject at considerable depth for the last several years. But even after having studied this for a long time, I don’t claim to have all the answers. There are things in prophecy that elude the best explanation. I believe this is mostly true of time prophecies of Daniel and Revelation. And as a Bible student, I must resist the temptation of offering a neat and indisputable explanation for these times periods. It’s simply not as clear-cut and our evangelists have made it to be. When in doubt, it is best to let the prophetic text lie in its original, unadulterated state without trying to impose an interpretation on it. Today, as an Adventist from birth, I live on parallel universes. In one of them, I live in blissful abandon, believing that the neatly concocted eschatological sequence will ultimately vindicate Adventist teaching. This is comfortable, sunny place to which I’m frequently called. The other universe is the one created by my doctorate in biblical studies, which requires exhaustive study, cogent articulation of ideas and solid proof for any statement purportedly based on Scripture. In this universe, I am constantly called to question theological assumptions and either present strong evidence or place things on a (very) tentative basis. This is an uncomfortable place to be in, a place where questioning takes preeminence over believing. It is most of all, a place where humility replaces interpretative assertiveness. However, contrary to my Adventist friends from the 80’s, living in the continuous dissonance of these parallels universes has not taken me to a place where I feel I need to reject Adventism. To the contrary, realizing that a certain Adventist interpretation may be incorrect has convinced me that the Adventist Church as successful, modern Christian denomination must have more to offer to the world than a single prophetic interpretation.3 I feel strongly that this movement has a special place in God’s heart and a special mission in the world today. This continues to be my church. My experience as Bible exegete is that it appears that we have been given in to the temptation to hold on to tradition instead of continuing to study Scripture. We have overstated our case and stretched the evidence in order to confirm our “prophetic identity.” And frankly, that is all 1844 really is, it only massages our corporate ego, it does little for the individual believer. I can believe that Jesus has been my perfect intercessor since the ascension without jeopardizing my standing with God. Adventism has been pushed into a theological corner where the least question about 1844 gives rise to pious outrage and tearing of garments. “The very foundation of Adventism will be removed!” say strident voices. But this corner is an artificial one. I refuse to believe that Adventism’s relevance hinges on a single prophetic interpretation. I reject the voices who call for the sacking of those who do not accept another’s interpretation of the Bible. God can raise a movement any day without needing questionable prophetic interpretations. We should have the humility to accept that we may have been wrong all along about the nature and timeline of Christ’s priestly ministry in heaven. “There is no excuse for anyone in taking the position that there is no more truth to be revealed, and that all our expositions of Scripture are without error. The fact that certain doctrines have been held as truth for many years by our people is not a proof that our ideas are infallible. Age will not make an error into truth, and truth can afford to be fair. No true doctrine will lose anything by close investigation.” (Review and Herald, December 20, 1892, italics supplied). “If the pillars of our faith will not stand the test of investigation, it is time we knew it." (Testimonies to Ministers, 107). Is it possible that this time has come and gone and we have missed the boat? 2. See Kai Arasola’s, The End of Historicism, p. 94 available here. The numerological method included the prophecy of Moses, 677 B.C., year of release, the age of the earth, the 6000 year theory, the terminus of the Jubilees to name a few. André Reis has degrees in theology and music and is currently finishing a Ph.D. in New Testament at Avondale College. His thesis is on the book of Revelation.